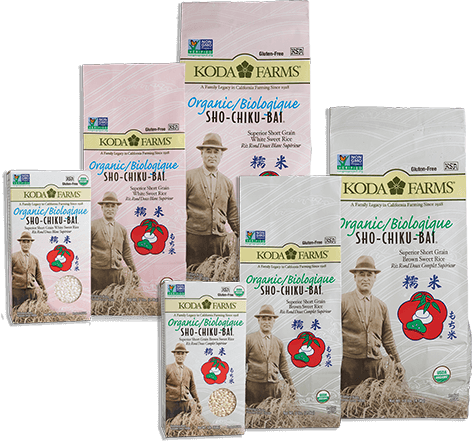 Kosher & Non-GMO, Koda Farms' Kokuho Rose® Japanese style white and brown rices, Sho-Chiku-Bai sweet rice, and Blue Star® Mochiko Sweet Rice Flour are available under various certifications. 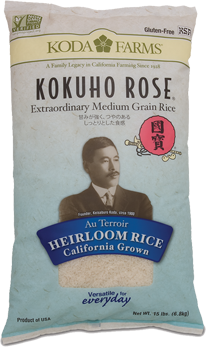 Heirloom Japanese style medium grain rice, developed in the 1950s specifically for our microclimate and soil type. Friction milled white, with a delicate floral flavor and a gently sweet afternote, it's light on the palate. Touted by gourmets as the perfect steamed table rice, its tender and sticky texture makes it also outstanding for sushi. Versatile and appropriate for other preparations dependent on a similarly starchy profile such as Italian risotto and Spanish paella. Less than 2% broken kernels. * Certified Kosher (KSA), GMO-free (Non-GMO Project Verified), Gluten-free. Pure unadulterated rice – no additives of any sort. Unlike modern varieties, proprietary Kokuho Rose is a true heirloom, possessing hallmarks antithetical to those prioritized in industrial scale farming. In essence, Kokuho Rose is slow to mature, low in yield and tall in stature – characteristics adding significant effort to its production. Preserving this unique strain of rice requires a three year commitment merely to produce the seed, which we fulfill by maintaining our on site, private seed nurseries. A perfect expression of the land it bred to thrive upon, we consider our rice to be "au terroir". * USDA industry standards allow up to 4% broken kernels. Heirloom Japanese style medium grain rice. Less than 2% broken kernels. * Certified Organic (CCOF - California Certified Organic Farmers), certified Kosher (KSA), GMO-free (Non-GMO Project Verified), Gluten free. Pure, unadulterated rice— no additives of any sort. Whole grain rice with bran layer intact, our "genmai" (Japanese for brown rice) is complex and subtly nutty. 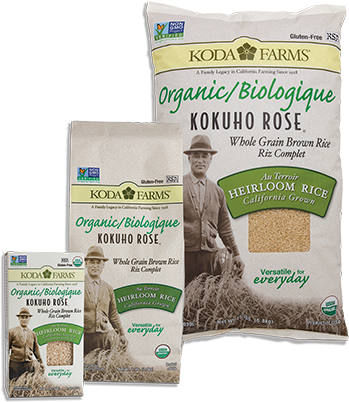 More substantial in tooth than our friction milled white rice, brown Kokuho Rose is a fresh alternative with slightly elevated fiber and nutritional content. Less than 2% broken kernels. * Certified Kosher (KSA), GMO-free (Non-GMO Project Verified), Gluten-free. Pure unadulterated rice – no additives of any sort. Whole grain rice with bran layer intact, our "genmai" (Japanese for brown rice) is complex and subtly nutty. 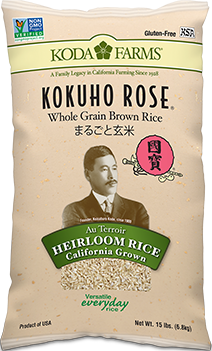 More substantial in tooth than our friction milled white rice, brown Kokuho Rose is a fresh alternative with slightly elevated fiber and nutritional content. Less than 2% broken kernels. * Certified Organic (CCOF - California Certified Organic Farmers), certified Kosher (KSA), GMO-free (Non-GMO Project Verified), Gluten free. Pure, unadulterated rice — no additives of any sort. Japanese style, short grain "sweet" or "mochi" rice is super starchy with specialized applications and not typically used as table or sushi rice. Grains are short, plump, and opaque and steam up in a sticky mass. Friction milled white. Less than 2% broken kernels. * Certified Kosher (KSA), GMO-free (Non-GMO Project Verified), Gluten-free. Pure, unadulterated rice – no additives of any sort. Sho-Chiku-Bai Sweet Rice is widely recognized as the best Japanese style "Mochigome" rice in America. Also known as "sticky rice" for its soft and tacky texture. Its delicate flavor and unique sticky texture are suited to specialized applications, from Japanese "mochi" and Korean confections to Chinese Dim Sum, to Filipino Bibingka. 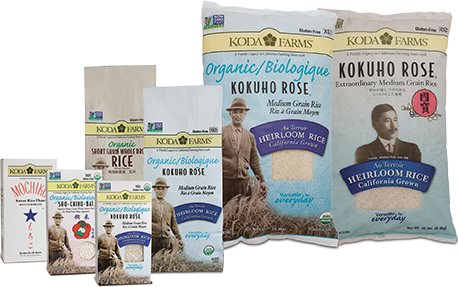 The Koda family was the first to introduce sweet rice to the domestic market in the 1940s and remains the premier producer of this specialty rice. Japanese style, short grain "sweet" or "mochi" rice is super starchy with specialized applications and not typically used as table or sushi rice. Grains are short, plump, and opaque and steam up in a sticky mass. Friction milled white. Less than 2% broken kernels. * Certified Organic (CCOF - California Certified Organic Farmers), certified Kosher (KSA), GMO-free (Non-GMO Project Verified), Gluten free. Pure, unadulterated rice— no additives of any sort. 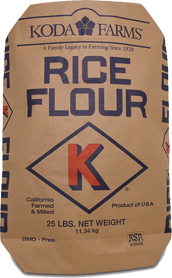 Sweet Rice Flour milled from California farmed, short grain sweet rice. Gluten-free, no additives of any sort, certified Kosher (KSA), GMO-Free (Non-GMO Project Verified). 105 Mesh. Since the 1940s, we've dedicated our flour mills exclusively to the production of rice flour - we do not toll-mill or co-pack for outside entities. 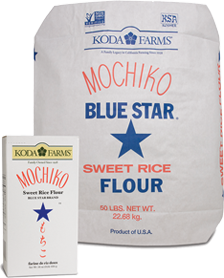 Cold-rolled Blue Star® Mochiko Sweet Rice Flour is composed of California farmed, pure, unadulterated short grain sweet rice. Mild and neutral in flavor, with superior thickening qualities. Originally introduced to the American market as a thickening agent alternative to corn starch. Contemporary applications include microwave mochi and inclusion in some gluten-free cooking. Sweet Rice Flour milled from California farmed, short grain sweet rice. Gluten-free, no additives of any sort, certified organic (CCOF – California Certified Organic Farmers), Kosher (KSA), GMO-Free (Non-GMO Project Verified). 105 Mesh. 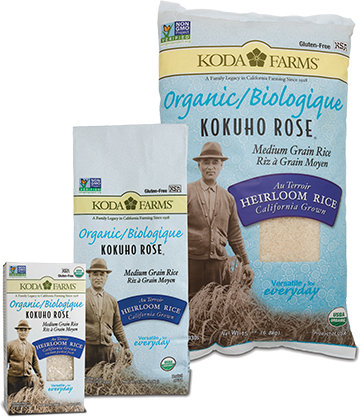 Our Rice Flour is cold roll milled from our California farmed heirloom Kokuho Rose medium grain rice and is well known amongst Asian Indians for the preparation of crepes (dosas) and other snack foods, and additionally is useful for specialized applications of gluten-free baking/cooking. Gluten-free, no additives of any sort, certified Kosher (KSA), GMO-free (Non-GMO Project Verified. Mild and neutral in flavor. 105 Mesh.